So you’ve figured out your personality type and your anxious to know more! But all the sudden you’re hearing words like Si and Ni and Fi and Fe. What does all this mean? The deeper you look the more confusing it may seem. At first you may have just thought you were an introvert with a preference for sensing and feeling, but now you’re seeing words like Introverted Sensing and Extraverted Sensing, or Introverted and Extraverted Feeling. You may also be unsure of your type. Perhaps you feel torn between sensing and intuition and aren’t sure which one resonates more with you. 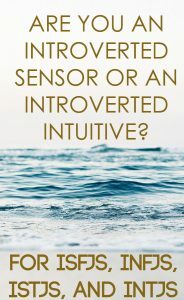 Two of the most confusing functions to explain are Introverted Sensing and Introverted Intuition. These functions are referred to as Si (Introverted Sensing) and Ni (Introverted Intuition). If you’re an ISFJ or an ISTJ you would be called Si-dominant. If you’re an INFJ or an INTJ you’d be called Ni-dominant. These preferences create major differences in how these four types view the world. Each personality type has a favorite perceiving function and a favorite judging function. The perceiving function determines how we absorb information and which things we notice and trust. The judging function determines what we consider when we make decisions. SJ types prefer to absorb information through Introverted Sensing, while NJ types prefer to absorb information through Introverted Intuition. – They are keenly aware of all the details around them. – They are down-to-earth and outwardly matter-of-fact. – They absorb and place importance on proven facts, which they can recall swiftly. – They tend to be hard-working and responsible. – They have a respect for history and traditions. – They enjoy tried-and-true techniques. – They focus on what already exists and prefer to deal with concrete realities, facts, and examples. – They form future forecasts based on what they’ve learned through personal experience. – They thrive on routine and like to know what to expect. – They are very detail-oriented and attentive, but can be less aware of “the big picture”. – They are very aware of inner body sensations like hunger or illness. – They tend to be careful with money. – They are often described as “conservative”, “practical” or “level-headed”. – They are extremely determined and single-minded. – They are extremely individualistic and independent. – They focus on potential and deal with abstract concepts, symbols, archetypes, and ideas. – They are determined to discover and pioneer new roads and unveil new research. The tried-and-true technique bores them. – They tend to find the routine and the practical day-to-day aspects of life mundane. – They keep a constant eye on the big picture and are less aware of all the details. – They are tirelessly driven by their inspirations, and tend to be attracted to the fields of science, invention, writing, psychology, philosophy, teaching, and politics. – They have keen insights into the deeper meanings of things. – They are very strategic and can easily piece clues together. – They see underlying patterns and clues that help them to determine a future forecast. – They are often referred to as “visionary” or “grandiose”. Introverted sensors have a vast memory bank of stored impressions, facts, and details that give them unshakeable ideas and viewpoints. Si-dominant personality types can easily recall details and experiences from the past and then they use this information in combination with their judging process (thinking or feeling) to make decisions. Si-dominant types are not impulsive, but careful in all their decisions. They consider what they’ve learned, from mistakes, from memory, from their education, and they take all that accumulated knowledge and apply it to their decisions. They create stability for the people in their lives, and crave stability in their own lives. They enjoy having a routine, and they find comfort and joy in traditions they can count on. The Si-dominant individual instantly compares current data to past information. When they learn new things they immediately scrutinize the new information against a vast storehouse of information they’ve accumulated in the past. Offenses, slights, kind deeds, these things are rarely forgotten. For this reason, Si-users place great importance on keeping their word and forming relationships with people who keep their word and are consistent and dependable. Si-users believe in being responsible, in following through and completing projects, and they tend to be rattled by change and unpredictable or unfamiliar situations because they can’t compare these situations to past collected data. 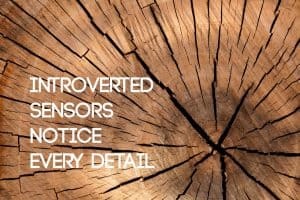 Introverted Sensors pay attention to concrete details and facts. If you show them a piece of artwork and ask them what they noticed, they will likely point out all the physical details (“I saw three tall pine trees, the sky was bluish-purple, there is a woman standing on edge of the mountain wearing a blue dress”). The Ni-user is more likely to get an overall impression of what the image might symbolize (“This picture is about escape”, “This woman is considering jumping off the edge of that mountain”, “there’s something ominous about the dark color of the pine trees and the way the woman is looking into the distance”). If you’re trying to make a decision about something but are unsure about the facts and details involved, you’ll want to talk to a Si-dominant personality type. They can easily pull from their memories to give you all the details that are so necessary to know before deciding what step to take next. They aren’t the types to make forgetful blunders because they are very careful, responsible, and attentive to all the practical facts needed to support a decision. 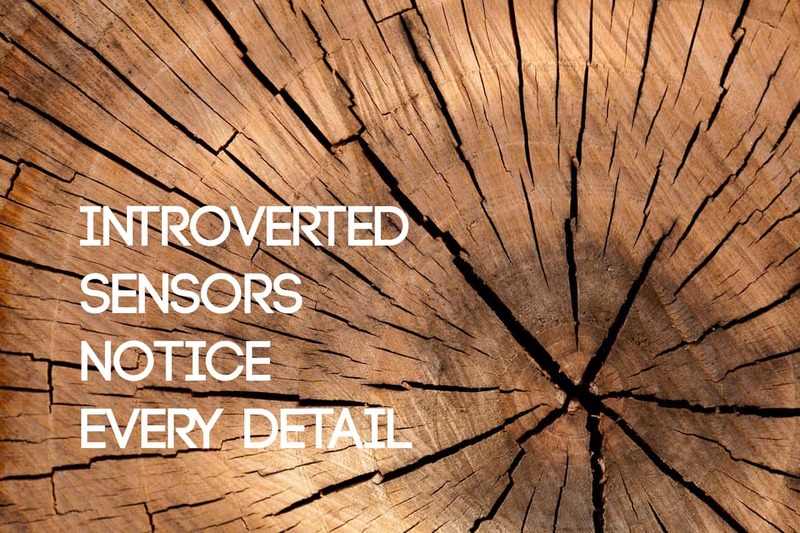 Introverted Sensors trust what they can see, touch, taste, smell, or what they know through experience. They also trust authorities and place value in credentials. They especially trust their own past experiences. Ni-dominant personality types (INTJs and INFJs) have an advanced insight and awareness of patterns and underlying meanings. They can quickly understand complex or abstract concepts, but may have a harder time remembering concrete, sensory details (as Si-dominant types would). Where the Introverted Sensor focuses on what “is” the Introverted Intuitive focuses on what lies “behind the curtain”. This is why Si-users are more likely to take things at face value, whereas Ni-users are more likely to read between the lines. Exceptions to this occur when Si-users have a reason related to the past where they may need to distrust something someone is saying (ex. “This person has lied to me before, so I need to read more deeply into what this person is saying now”). Introverted Intuitives focus much more on the future than Introverted Sensors do. Ni-dominant types are always looking ahead, trying to determine what will be. They do far less comparing and contrasting with past experiences, and are less fond of “tried-and-true” techniques. They are less interested in authority, credentials, and past experience, and are more interested in finding a new pathway or manner of doing something that has never been done before. This isn’t to say they don’t learn from the past or trust anyone in authority, but they don’t trust the past as readily as a Si-user would. They are naturally skeptical of authorities or what is accepted as the standard. They are more driven to find their own way to knowledge and progress. I like to think of the Si-users brain as a collection of filing cabinets, neatly labeled, filled with very precise and detailed concrete information. I think of the Ni-users brain as a giant collection of puzzle pieces, each one seemingly meaningless, but when connected properly forming an astounding insight into the future. Both the Si-user and the Ni-user need to have a little pause of alone time to access either their filing cabinet, or put together their puzzle, and the Si-users information will be more concrete and practical whereas the Ni-user is going to veer more towards insightful and visionary. Introverted Intuitives are keenly aware of patterns, trends, symbols, and hidden meanings. They can pick up on a multitude of clues that other people might ignore, and they frequently surprise people with their “aha” revelations about the future. Ni-dominants are incredibly strategic people, and love to plan out all the little steps that can be taken to meet their one “master plan”. They can easily see how events will unfold and are often one-step-ahead of others when it comes to knowing what will happen in the future. If you want to know how your current choices may play out someday, talk to an INTJ or an INFJ. You can tell them all the details, the actions you have been taking, and they will tell you what the future implications are. This is easy for them, it’s their “master skill” in a way. Introverted Intuitives are the ultimate “big picture” thinkers, looking for the ultimate truth and meaning behind everything. The Si-user is more likely to miss seeing the forest for the trees, and the Ni-user is more likely to miss seeing the individual trees because of the forest. Introverted Sensing is about memories and details, and Introverted Intuition is about impressions and meanings. Where Si-users trust what they know through experience and what is concrete, Ni-users trust patterns, underlying themes, impressions, and symbols. They just “know” things intuitively and they hold to these insights with unshakable resolve. This isn’t to say they are illogical, both INTJs and INFJs have a strong sense of logic. They will both test their insights against logic after they have had them. However, they have a stronger belief in the “impossible” or the existential than Si-users tend to have. Absolutely not! We need sensors to remind us of what is real, what makes the most practical sense, and to help us keep track of details that intuitives are more likely to miss. We need them to retain information from history and uphold positive traditions. We need intuitives to grasp what things mean for the future, to strategize, and to unlock new discoveries about the meaning of the universe and “the big picture”. Both types are equally vital to humanity and each has its own unique abilities that should be admired. Feel Like Sharing Your Thoughts? Hello, my name is Kimberley. I have a question, or 12. I have taken the MB test twice. Once for a job & again online, most recently. Both times I received the same results. My “N” was scored at 54 & my “S” scored at 46. My “I-T-J” were all scored 97 or higher. What does it mean that my N & S are scored so closely, other than I use both of them. Reading about both of them gets confusing & I get the feeling that i dont even fit in with the weirdos sometimes, because im even weirder than they are, lol!! How often does this happen & what does it mean about my personality & how i put things together? Is this why it is so hard for me to make decisions sometimes & other times I make compulsive decisions? This is the only article I have found that compares the two “N” & “S”. I have yet to find any about if the scores are not “hard” & you lie between two designations. Any information or insight would be greatly appreciated!! I’m the same way (S and N very close in percentages) while I-T-J very high. When I do MB testing, it shows me as an INTJ yet I feel that ISTJ also fits. Also looking for further insight into how the S or N functionality works. ie maybe under stress I flip from INTJ to ISTJ? I’m a Ni user, but trust me when I say so, I like things organized too (Si). I want to be so organized with all the waypoints set, that all the GPS has to do is steer the boat from A to B to C, while I sit in the cockpit and relax.